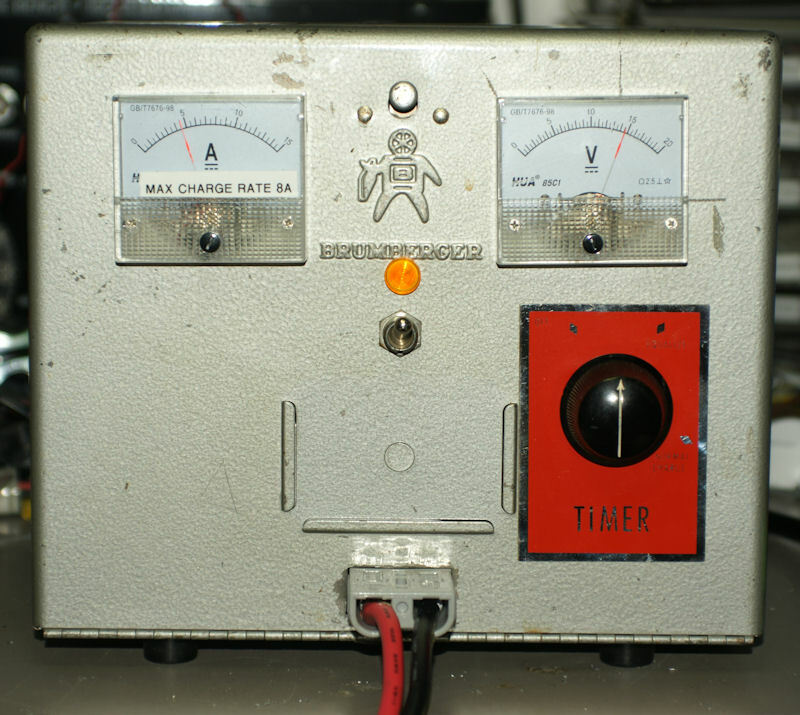 A while ago I had acquired an old 8 amp selenium rectifier car battery charger. I took the parts from that and built a new one. But I needed a case. I had discarded the old one. I laid them out on the front and cut the holes out. 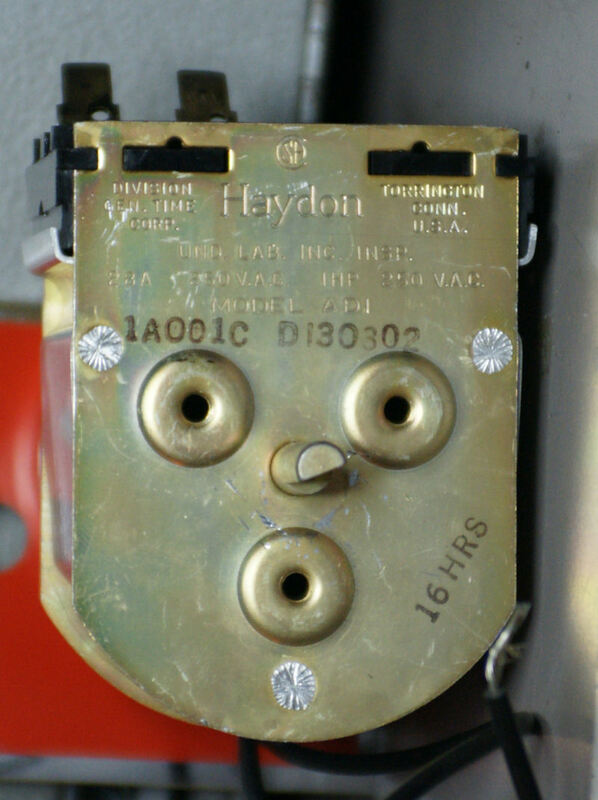 The timer I got is a Haydon Model ADI 1A001C D130302. 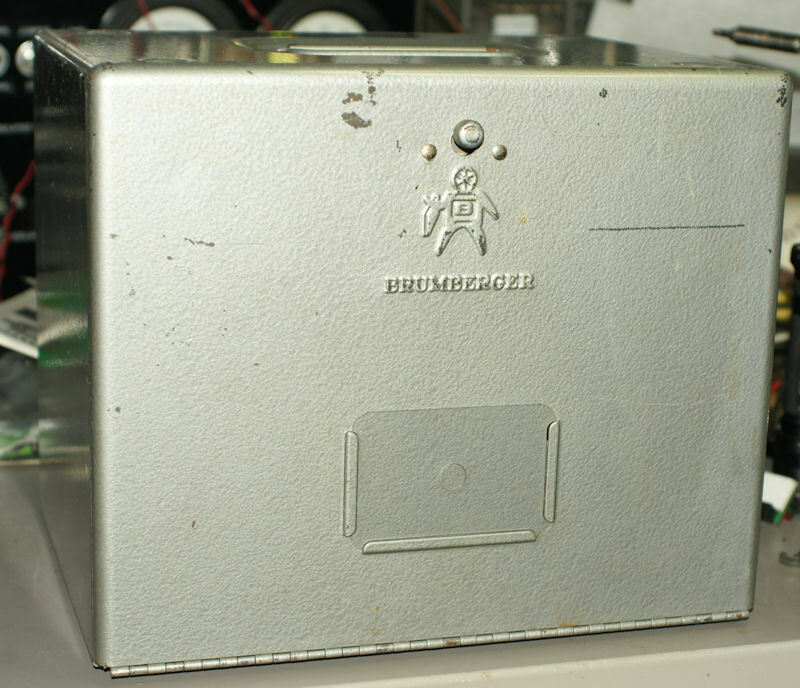 The actual timer on the back is a General Time E15450 A2631A1 timer. 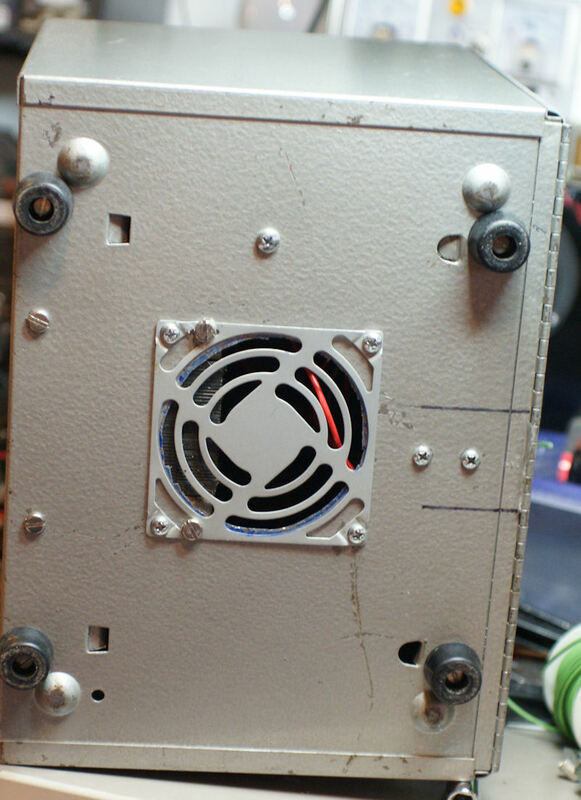 The unit has 2 black wires for 120vac 60hz and 2 spade connectors for the switch. 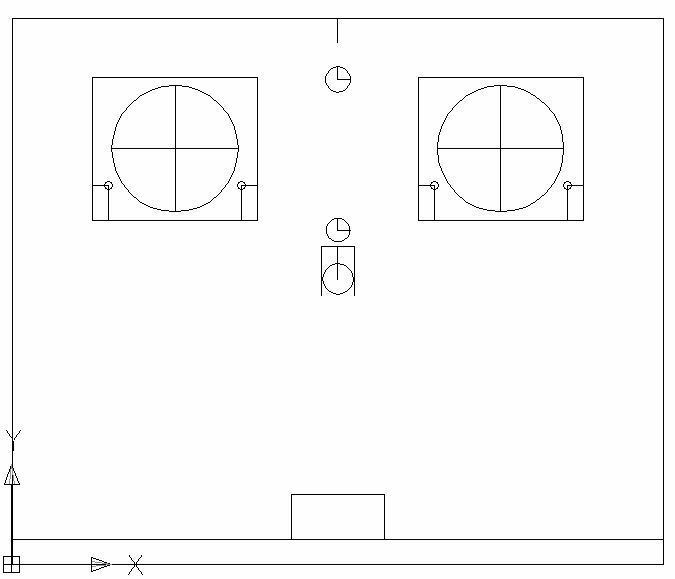 The switch can handle 250vac 28 amps. The shaft is a standard D type. 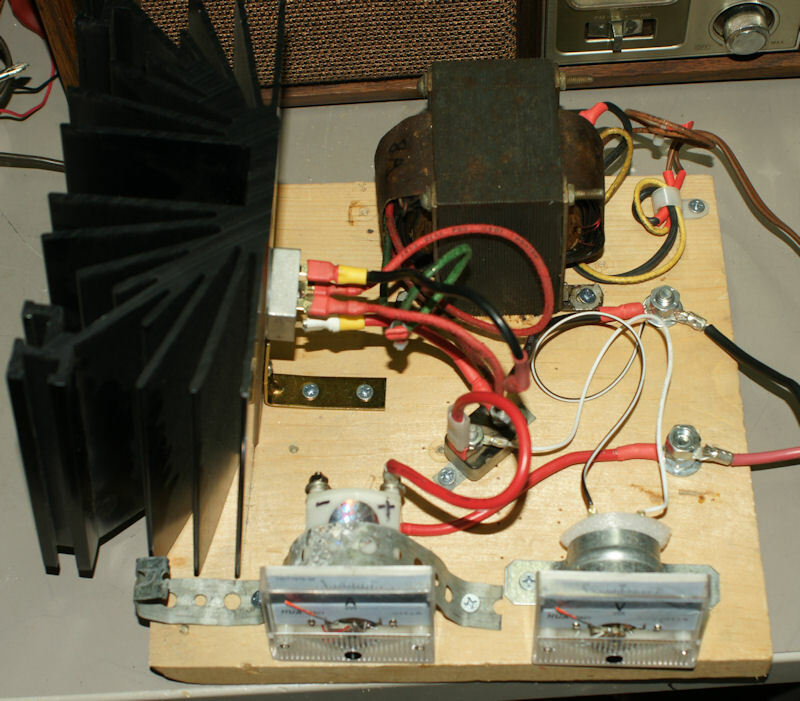 I will use a 25 watt 10 ohm POT's so I can vary the input voltage to the transformer. This charger originally had selenium rectifiers so the output voltage is about .5 volts too high. I need to reduce that and do not have any diodes that can handle the 14 amps that this charger can put out before the self resetting circuit breaker kicks in. I want to vary the input voltage anyways to experiment with some of the charging methods I have been reading about. 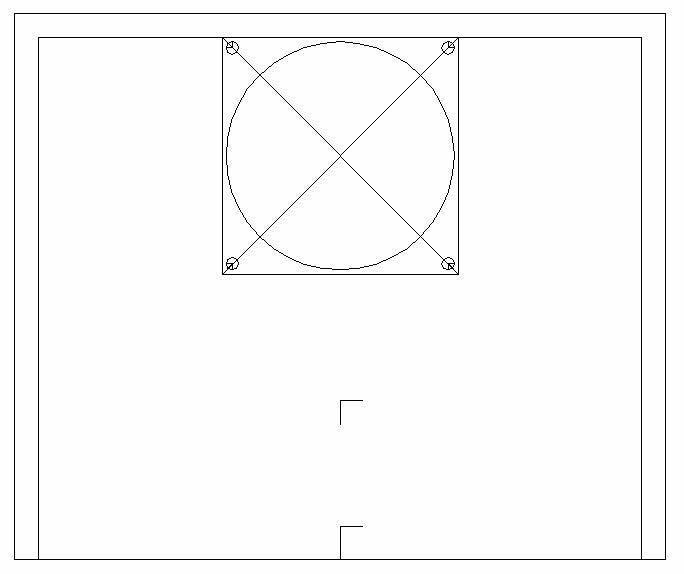 I only need to adjust between 1 and 8 ohms to reduce the input voltage from 125 vac to 115vac if needed. My wall voltage can get rather high sometimes. I do not want to use a variac. I also do not want to over complicate the charger with a DC voltage regulator. I used a 50 amp quick disconnect so I can connect the charger to standard clamps and to other types of connections. There is only one fan on the back, the bottom is just a vent hole. 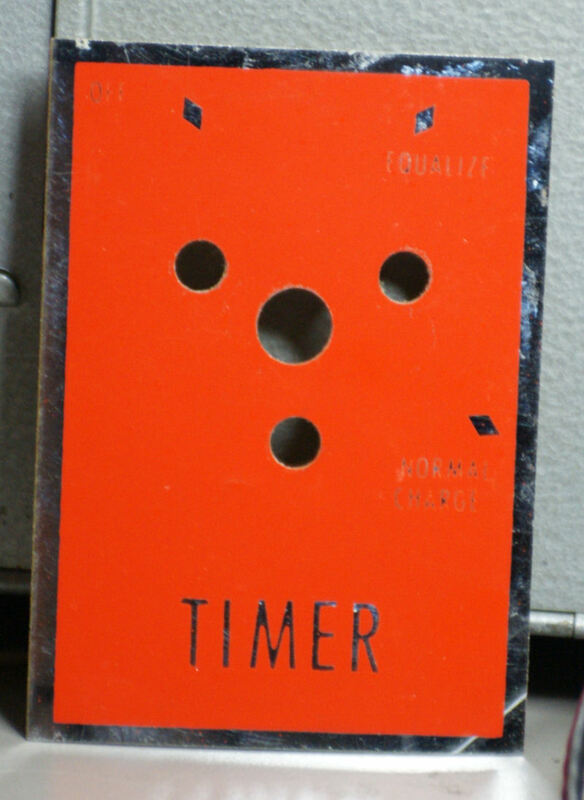 The timer is set by moving it clockwise or counter clockwise to either "normal charge" or "Equalize". The timer moves clockwise and opens the charging circuit when it hits off. 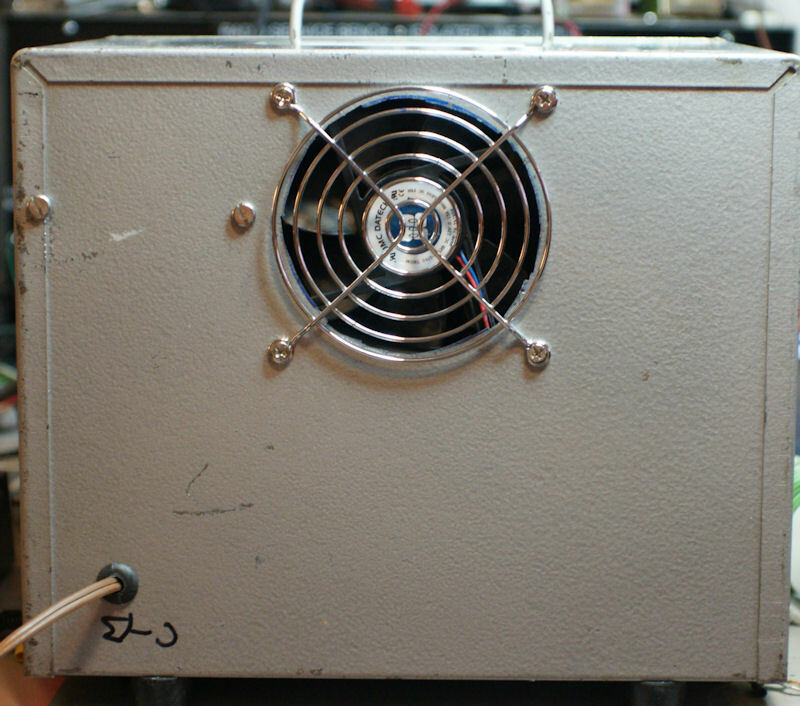 The separate power switch means that the fan will continue to cool the unit once charging has completed. 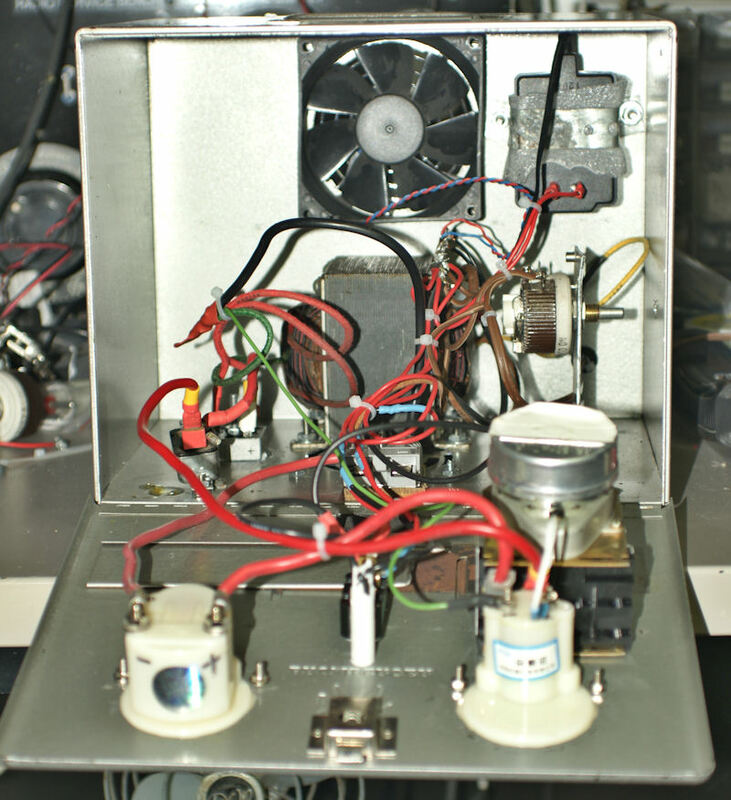 Funai Magnavox TB110MW9A does not power on. green light flashes and then stops flashing and stays solid green. nothing but snow on the tv. My wife's aunt had this problem. I replaced hers with a different model but decided to see if I could fix it. I opened it up to look for swollen capacitors but there were not any. I tested the voltages in the power supply and the voltages on all the voltage regulators. They all seemed ok. Finally (with some fiddling) the unit came on. I started carefully moving things looking for the problem. The problem ended up being the small vertical card with the large chip on it, If I moved it the unit would lose picture and go to snow. 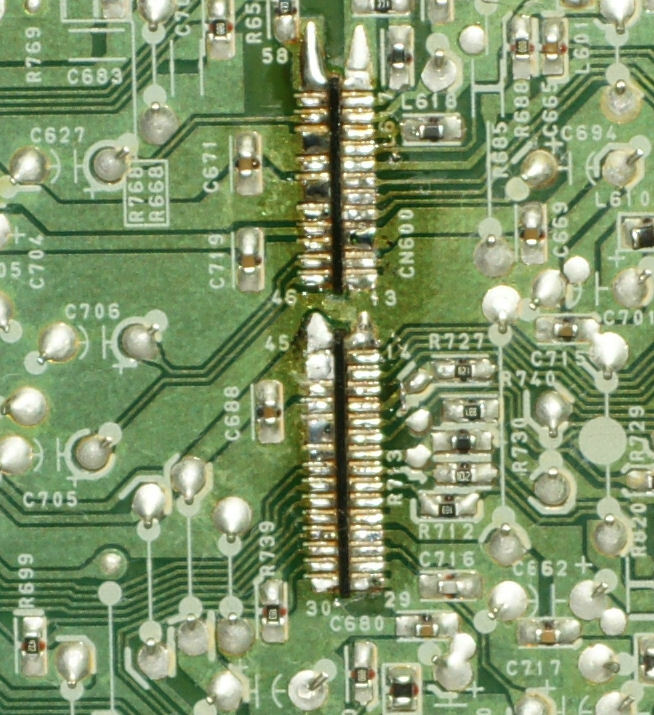 The fix was to re-solder all the tabs on it. That was it. It now powers up and shuts down properly. I have a legit copy of Win96 and Win500 and for reasons I do not know they both stopped working. Searches of the internet showed lots of solutions for citrix and terminal servers (which these files are not on) nor are the files on a network share. The solution is to go in to System properties, Performance Settings, Data Execution Prevention and to add the win96.exe and win500.exe to the list of exceptions. Below are the error message related to the problem. 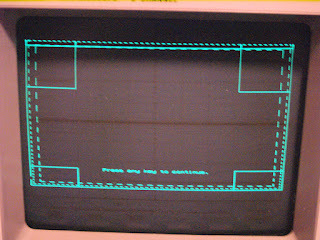 Windows cannot access the file for one of the following reasons: there is a problem with the network connection, the disk that the file is stored on, or the storage drivers installed on this computer; or the disk is missing. Windows closed the program Win96 Scanner Utility because of this error. Windows cannot access the file for one of the following reasons: there is a problem with the network connection, the disk that the file is stored on, or the storage drivers installed on this computer; or the disk is missing. Windows closed the program Win500 Scanner Utility because of this error. I saw a video by Joernone where he shows a crystal tester he built. I thought that would be pretty cool to have but I did not have some of the components to build one. While looking to order them I found a completed board that does all the same things plus a go/no go light for a pretty reasonable price. I bought the board, made some minor modifications to it, and mounted it in a project box. I went through all the crystals I had, I only found one dead one, a couple that oscillated strangely, and almost all of the crystals were spot on (or very close to) their rated frequencies. I received this monitor from my work several years ago and it was working perfectly up until a couple of weeks ago. play minecraft and exit the monitor loses it's settings and I run a special program to restore the settings. Lately my monitor had a pink cast to it that would not go away when I ran the program to restore the calibration. I thought maybe it had lost it's calibration so I did a fresh calibration and that seemed to fix it... for about 20 minutes, then it went pink again. I did another calibration and it seemed to work but after 5 minutes it started flashing between pink and calibrated. I opened it up and it did not appear to have bad electrolytic capacitors but I replaced them anyways. I tested the old caps and all of them were leaky including the large 450v filter cap. Yesterday we had Candy put down. Candy was my sister Pam's cat. Pam had got her some time around 2000 and about 2 years after Pam died we got Candy. Candy did not like other cats and her meow was broken. She could only meow when she tried really hard. About a year ago she started losing weight and would not eat dry cat food, so we started her on the geriatric cat diet of canned cat food. She mostly only drank out of the toilet which we called "the fountain of youth" A couple of times she fell in. She would often throw up her food and even throw up water. About 2 days ago she stopped eating and she started peeing in random places. She had been pooping in random places for a while. Friday Kathi made an appointment to have here put down. Saturday morning Candy tried to use the litter box but nothing came out. She was very listless and could not hardly hold her head up. She would not eat, for most of the morning she could barely stand. At 9:30am we took he in and the doctor examined her. He found one of her kidneys was enlarged. She weighed 5.5 pounds. We had them put her down, but they had trouble finding a vein. They had to shave her front leg to find one. They barely injected her and she was gone. 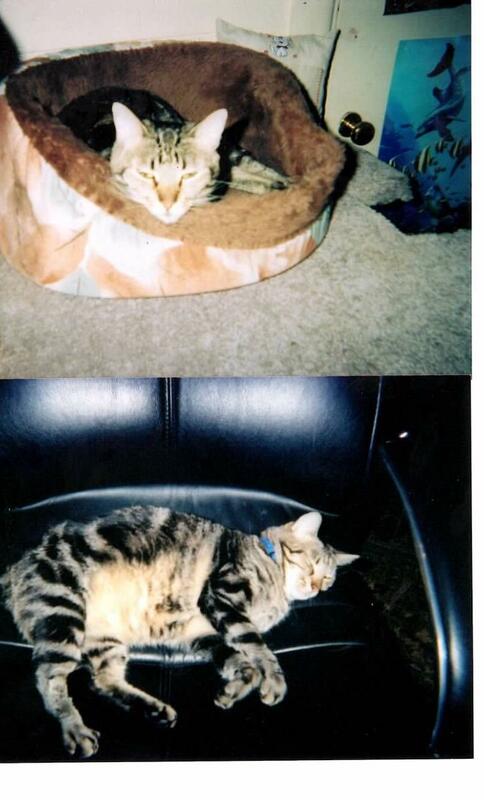 We think Candy was about 15 to 17 years old. We did not take her home as we already have 3 cats buried in the back yard. They will mass cremate her. We did not want her ashes or a casting of her paw. I think both would be weird. I bought a Hewlett Packard 54600A a year or so ago. Mine has screen burn in but was quite usable. 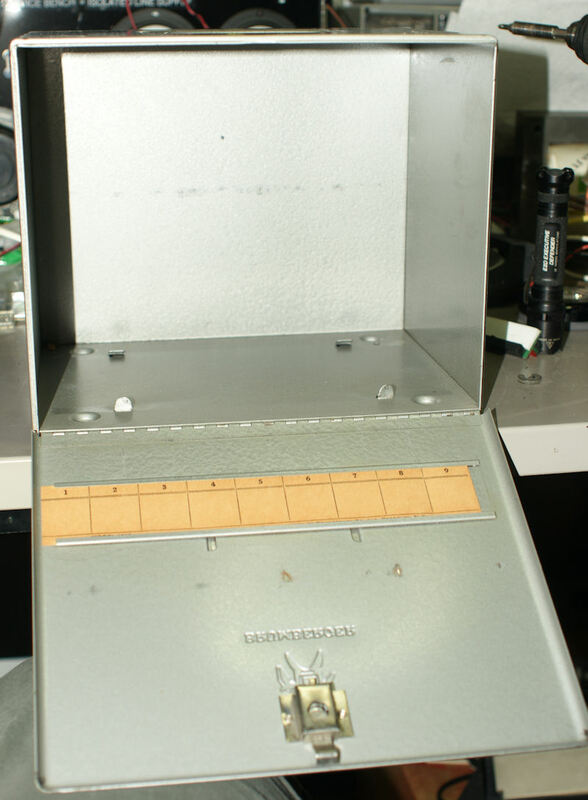 It also had a problem with some of the buttons not working and the control pots being touchy. This morning I turned it on after not using it for a few months (because of the issues it had). 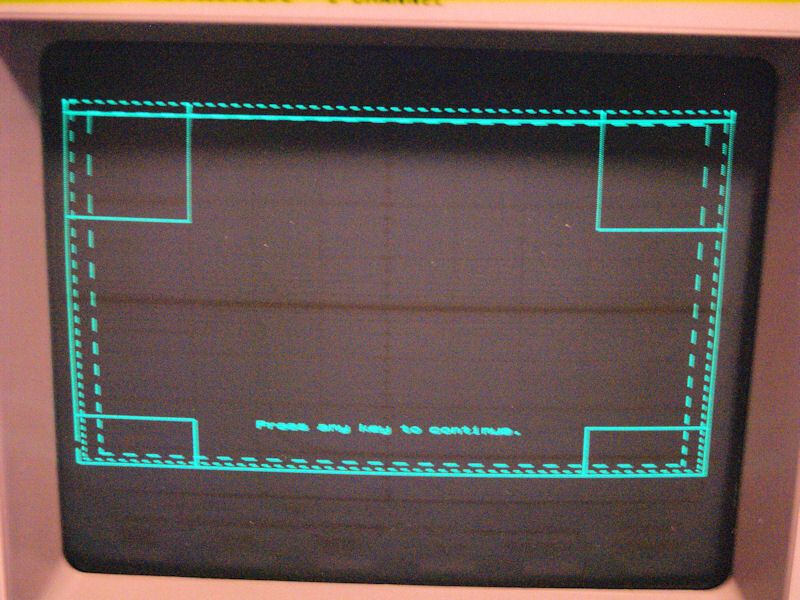 I noted the display was squashed and the top of the image rolled. I figured it was time to work on it. I found that the buttons were filthy with a huge build up of black stuff under the 2 I needed the most. I cleaned the switches and all the pots. 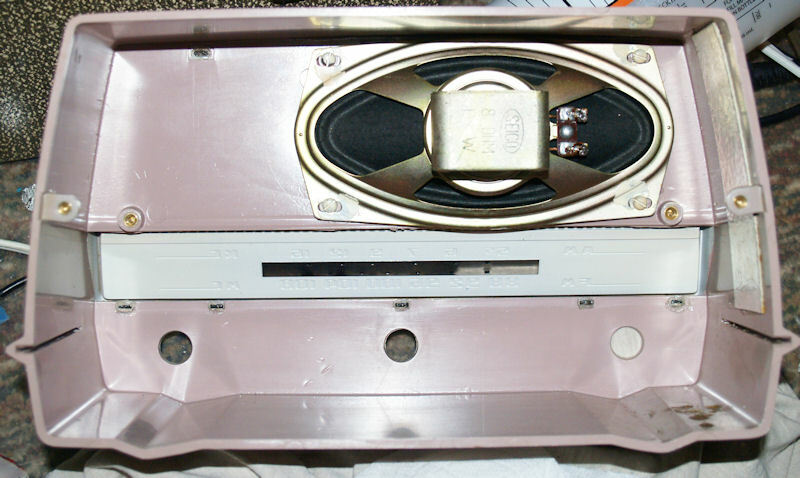 I researched the video image problem and found a forum where different people reported that either electrolytic caps C608 or C609 were the problem. In my case since I had it opened I replaced both. I also adjusted the B+ voltage to 14vdc as it was off by almost half a volt. I have been trying to get one of these for a while now but whenever they show up on ebay they tend to sell for more than I want to pay. I got this one off of shopgoodwill for a reasonable price and it was quite grungy but worked with no hum. The picture above has the contrast out of whack as it was not as dirty as it looks. 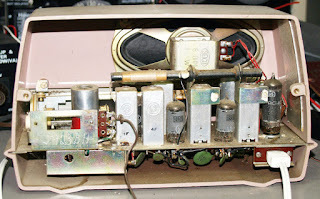 It had all its original tubes inside, all marked SEC Hitachi. 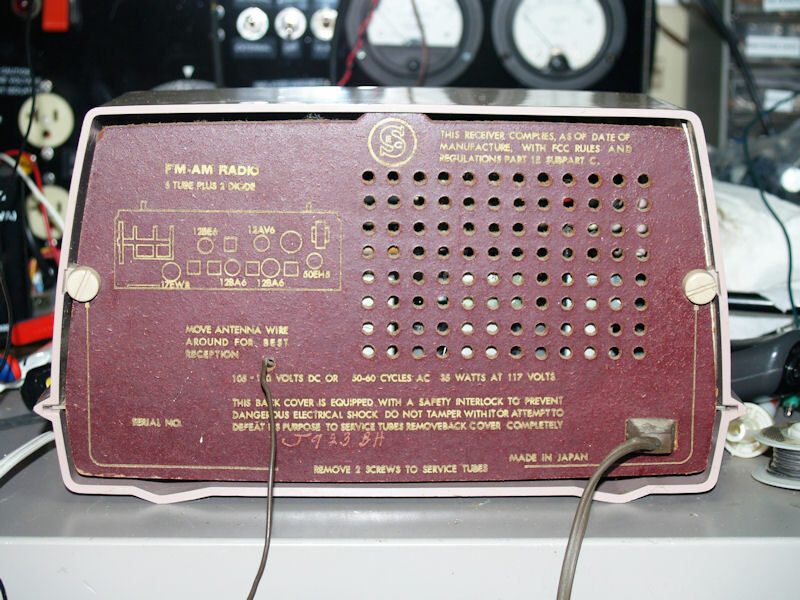 Some information I have says that it is made by Sansei, but radiomuseum says it is made by Zephyr in one listing and Sansei in another. Under the chassis there is not much that needs to be replaced. 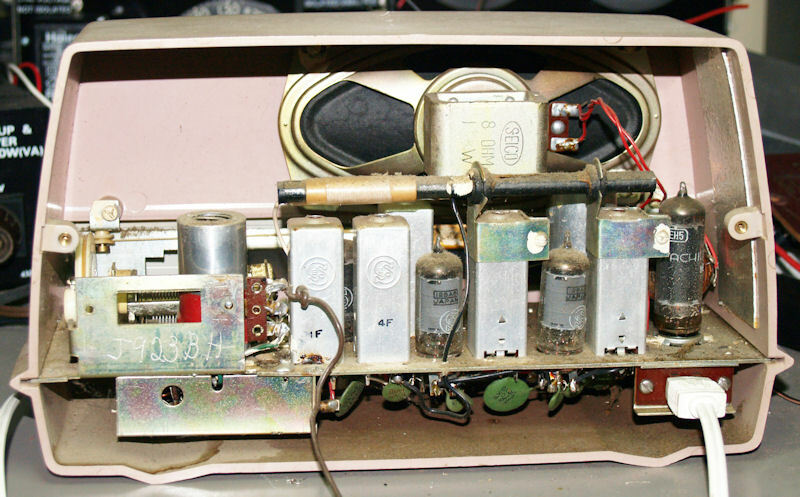 The square metallic box under the large green capacitor near the volume pot is the rectifier in an unusual mount. 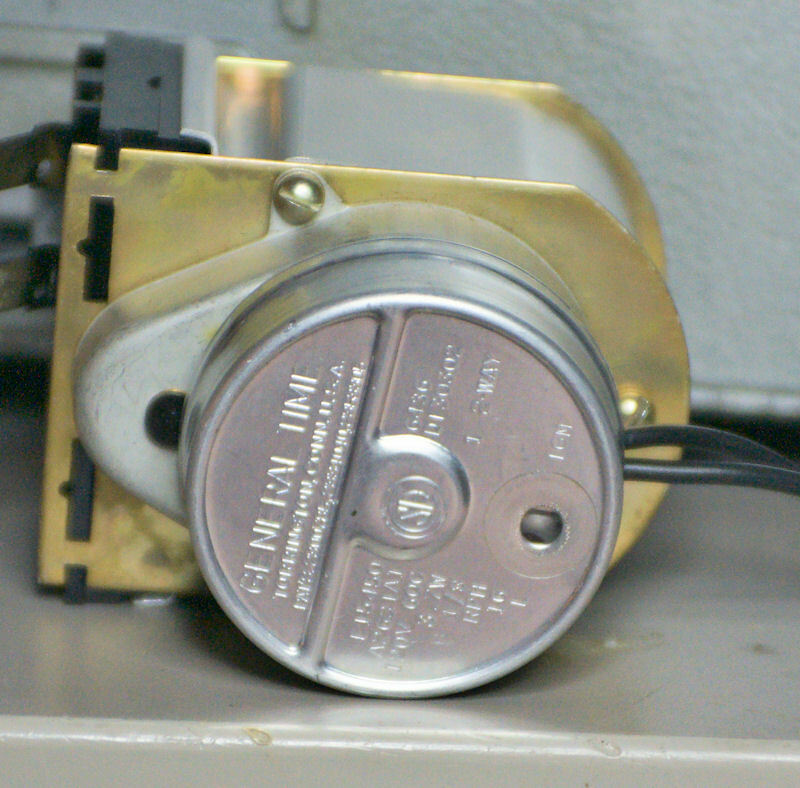 I only found one Electrolytic in the detector circuit and 3 60uf electrolytics in the filter cap. All of these Japanese AM/FM radios I have worked on have similar circuits and the same filter caps. I have found that you can replace the 60uf's with 47 or 50uf's with no hum. I removed the chassis, and the speaker to give it a good bath with simple green. Polished the plastic and I am listening to it as I type this. 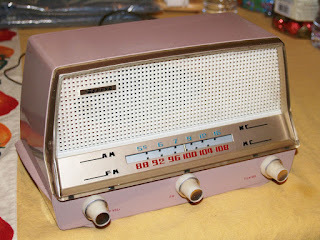 The dial is spot on, it tunes just fine and everything sound great I really like these 1960's Japanese radios they hold their alignment for decades. Many of them sound really good, and the build quality is rather high with zinc plated or gold anodized chassis, in many cases tube retainers, and many of the come with a fuse already installed. I especially like the look of them, they just look totally different than most of the radios that were out at the time, or even later. I like the reverse painted dials especially. The things I don't like about them are that the plastic often shrinks and or cracks around the screw holes, they suffer from SMD, and the dial covers or face plates are melted in place. I was working on my 1989 Chevrolet C2500 truck. The temperature gauge was not working and so I figured the temperature sensor needed to be replaced, Since the gauge worked when the gauges all ran through their test when you start the truck. I also notice a small leak where the thermostat is. Today I replaced the thermostat (even though it was fine), replaced the sensor and tested the truck. WTF it still does not work. I also notice I still had a tiny leak and re-tightened the bolts on the thermostat, that's when I noticed a wire that had a connector dangling near something that look kind of like the sending unit I replaced but with a different connector. There was a second temperature sending unit down by the exhaust, the connector is just clipped on, and had come off. I reconnected it, zip tied it in place, and.... now the temperature gauge works! DOH!